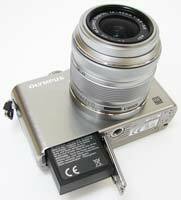 The Olympus E-PL3 (also known as the Olympus PEN Lite) is a brand new 12 megapixel compact system camera. With a stylish metal body, the EPL3 features the world's fastest auto-focus system, a high resolution and tiltable 3 inch LCD screen, 5fps burst shooting, 1080i HD video recording, a maximum sensitivity of ISO 12800, sensor-shift image stabilisation, a hot shoe and an accessory port. 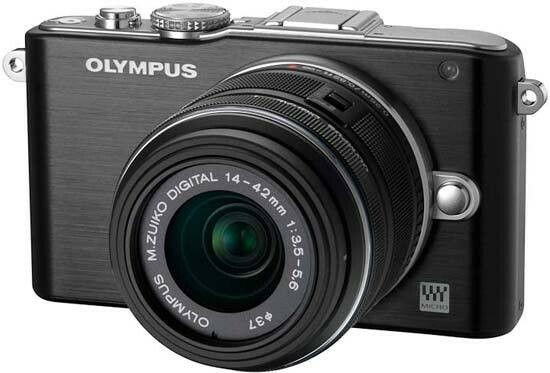 The Olympus PEN E-PL3 is available in silver, black, white or red for a retail price of £549.9 / $699.99 for the 14-42mm standard zoom lens kit. Considering that Olympus only announced the E-PL2 at the start of 2011, the appearance of the E-PL3 Digital Pen, also colloquially known as the Pen 'Lite', just over seven months later seems almost indecently quick. 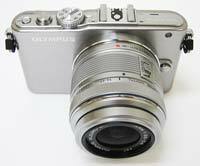 According to Olympus, sales of the E-PL2 have now ceased. But, with the tandem launch of the flagship E-P3 and baby of the range E-PM1 'Mini' Pen models at the close of June, Olympus seems to be very much throwing down the gauntlet to rival mirror-less, interchangeable lens compact system camera manufacturers. At the last count these competitors included Sony with its ever-increasing Cyber-shot NEX range, Samsung with the less well adopted NX, Panasonic with its ever popular Lumix G series, and Pentax with its interesting looking new Q system. So perhaps Olympus, who arguably brought the first truly compact mirrorless model to market in 2009's E-P1, following on from Panasonic's G1, is looking to maintain its early lead in winning over the hearts, if not always the pockets - in the UK at least that'll be Panasonic - of keen amateur photographers wanting near DSLR quality without the attendant bulk. 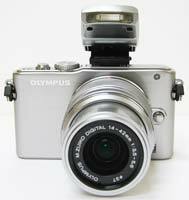 To get straight to the point, even though the headline resolution of 12.3 megapixels from a high speed Live Mos sensor has remained static, the hot-out-of-the-factory E-PL3 is the first Olympus Digital Pen to include an angle adjustable, wide-screen ratio tilting LCD screen at the rear. It's 3-inches in size, offers a widescreen aspect ratio and comes with a respectable 460k dot resolution, so visibility is certainly clear enough if not quite a match for the OLED screen on the E-P3 model. In respect of its adjustable LCD it recalls Sony's NEX series, and also mirrors its rival in the fact that said screen can be pulled out from the body and tilted up or down, but not, however, swung out through 180° so that it is parallel to the chassis, like on a camcorder or mid range DSLR such as the Canon EOS 600D. Nor can it be turned so that the screen is facing the body for added protection against scratches when being transported (without lens) in a jacket pocket. While its angles of adjustment are slightly restricted then, it's also not, as might be reasonably expected, a touch screen like the one on the new E-P3, and to be honest its on-screen icons are a little on the small side for accurate selection via a finger tip anyway. Still, let's not criticize the E-PL3 for what it doesn't do and just be grateful that Olympus, unlike Panasonic with its GF models so far, has included a usefully non-fixed screen for easier low or high angle shooting. Once again there's no viewfinder supplied here as an alternative, though like the recently reviewed E-P3 there is an accessory port Version 2 to be found above the screen at the E-PL3's rear. Tweaks aside, the raison d'etre of the E-PL3 remains the same as its predecessors: high quality images (and video) from an interchangeable lens camera that's perceived to be less fussy to operate and transport than a DSLR. In both respects this third iteration largely succeeds; up to a point. For a suggested price of £549.99 with lens the E-PL3 comes bundled with a distinctly plastic-y feeling M.Zuiko Digital 14-42mm f/3.5-5.6 II T lens (one of 20 available dedicated Micro Four Thirds lenses), with an interchangeable 'decoration ring', and the same sleek, chic retro styling we'd expect from the Pen range. Though for us the flagship E-P3 is still the king in terms of looks and build quality, the E-PL3 feels reassuringly solid when held in the palm. 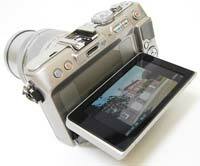 Dimensions are 109.5x63.7x37.3mm without protrusions and the camera weighs 265g body only. This latest Olympus is available in the usual array of colours, meaning black, white and red along with our traditional silver review sample, the metallic-finish backplate of which appears almost a pale lilac in certain light, contrasting with the brushed aluminium frontage. Another welcome attribute this model shares with the E-P3 is a claim for the world's joint fastest auto focus system, thanks to 35 AF points spread over the entire LMOS sensor, plus a TruePic IV processor to keep performance zipping along. Full time AF and AF tracking also feature. Once again the handholding Live Guide mode to help novices achieve more professional results is included on the E-PL3 too, with, as on the E-P3, its features selectable by tabbing up and down a visually-led menu that appears running down the right hand side of the screen. In this way the likes of depth of field/background blur can be adjusted in real time by dragging a simple slider bar. As this is the mid range Pen, it's no surprise to find that it doesn't quite match the E-P3 in all respects. There are 'just' six creative Art Filters on the E-PL3, all applied at the point of capture, compared with the E-P3's whopping 10. But thankfully included here are our preferred choices of pinhole and dramatic tone, joined by the tilt and shift lens ape-ing 'diorama' for rendering cityscapes as if on a toy town scale. Though the latter is a fun tool, we feel this miniature option works less well on the Olympus Pen than its competitors; for us the Pen seems to blur too wide a portion of the frame, so that occasionally the result can resemble a mistake rather than an effect. Once again, these filters can be applied to Full HD video as well as stills, recordable in AVCHD or reduced resolution Motion JPEG format. Just press the dedicated video record button when in Art Filter mode. Alongside body integral image stabilisation, something that gives it the Pen the edge over the Panasonic Lumix G range, Full HD video with stereo sound is included as standard, with left and right microphones positioned either side of a vacant hotshoe - the latter a feature that might also position it one step ahead of arguably Panasonic's closest rival in the Lumix DMC-GF3. If it weren't, that is, for the fact that what is more unforgivably omitted here is the luxury of a built-in flash of the pop-up variety - a feature that the E-PL3's intended consumer audience is surely going to miss. 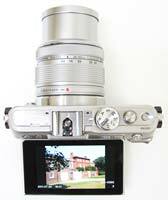 Just… why Olympus? After all, the original E-PL1 and E-PL2 had integral flash, and the flagship E-P3 now has it, an implementation long overdue. Instead, with the E-PL3 a separate plastic-y clip-on flash is included in the box that we can see getting lost down the back of the sofa, or simply forgotten when you head out for the day with your shiny new camera. Admittedly the flash does look quite cool when slotted into place and works effectively, but it does inevitably add to the camera's bulk. Though more positively it has gained the improved flexibility of that non-fixed LCD screen, the E-PL3 also misses out the proper handgrip that has featured since the E-PL1, though as with the removable grip of the E-P3 in aesthetic terms we actually think the camera looks better without it. Its absence lends greater visual emphasis to the brushed metal faceplate and the camera's relatively svelte proportions - which we'd still trade in for having flash on board however. Better news comes from the fact that low light sensitivity has been boosted on this latest Pen, incrementally extendable from ISO6400 to a semi pro-like ISO12800, as on the E-P3. This is partly down, says Olympus, to the implementation of a noise reducing Venus Engine VI processor. For no discernable reason we also found the E-PL3 was slightly better to lock onto target in lower light when using the auto focus than our recent E-P3 sample was. From the front then, and with or without attachable flash, the E-PL3 very much looks the part and worth the outlay, exuding a cool sophistication, at least in respect of our traditional silver review sample. It has that 'classic' Pen clean look, with an AF illuminator/self timer lamp top right of the lens, springy lens release button just below, Micro Four Thirds logo bottom right and Olympus logo top left. Moving up to the top plate, where its predecessors featured a pop-up flash, the E-PL3 now locates a speaker, with stereo microphones flanking the adjacent vacant hotshoe. This comes with a protective plastic cover that also loops over at the back to at the same time protect the accessory port against dust and other nasties. Set into a strip to the right of the hotshoe - if viewing the camera from the back - are a dime-sized shooting mode dial, small but obvious shutter release button and, lastly, inset into the top plate, the power button. Give the latter a press and if you haven't first manually extended the bundled retractable zoom lens, an on-screen text message prompts you to do so. So getting ready for the first shot is a two-tier process: either extend the lens first then press the power button or vice versa. Once the lens has been unfurled the camera is ready for its first shot (or video) in just under two seconds. A half press of the shutter release and there's a very brief wait while the focus visibly resets. Go on and take the shot and with no discernable shutter delay, a Fine quality JPEG and Raw file are committed to memory in two to three seconds, which is nothing to complain about. As from the top, from the back the E-PL3 appears a different beast entirely from its E-PL2 predecessor. At the top left hand corner where a slider switch formerly appeared to activate the pop up flash, instead here we get small self-explanatory playback and image deletion buttons alongside each other. With the accessory port dead centre above the LCD screen, to its right is a further trio of buttons. We get the function/thumbnail display button from the E-PL2 and an image enlargement button next to it, plus, at the top hand corner of the backplate, a dedicated video record button, positioned where it ergonomically falls under the thumb as the camera is gripped in the right hand. Hit this and recording begins no matter what alternative stills shooting mode might be in play at the same time, the black bands cropping the left and right of the screen when shooting in default stills mode disappearing so that the entire screen is taken up with the image being recorded. The function button is also the means by which as a default the E-PL3's Live Guide feature is brought into play, and the order in which the offerings are presented and what they actually are is identical to that found on the E-P3 flagship Pen. The Live Guide options are presented as a colourful toolbar on the right hand side of the screen. From the top we have the ability to change colour saturation, from 'clear & vivid' to 'flat & muted', next down is the ability to alter 'colour image', which translates as shifting the tone between warm and cool via slider bar, with the third option shifting brightness/exposure between a simple bright and dark. The fourth option down is probably the most interesting/effective in that it provides the ability to incrementally blur the background of your shot by again dragging an indicator on a slider - thus providing a similar shallow depth of field effect to that achievable with a DSLR and suitable aperture. For its fifth Live Guide option Olympus has retained the curiously named 'Express Motions', which to us has always sounded more like a bowel movement than the actual emphasizing of subject motion by introducing blur. Well, in fact, there's the option to both blur any movement or stop it in its tracks, again achievable by dragging a slider indicator. The last option on this tool bar is a on-board shooting hints and tips manual, with the usual 'suspects' of photographing children and pets given the most prominence ('take a picture at their height level' being a summation of the level of advice imparted). 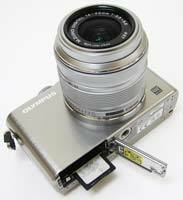 We even get tips, as a bit of closet advertising, for attaching Olympus accessories, such as lens converters. With a plastic/rubberized thumb pad just beneath the video record button, the final controls on the E-PL3's backplate are identical to its predecessor. An info button and separate menu button sit above and below a standard multidirectional control pad, encircled by Olympus' love-it-or-hate-it scroll wheel set up. At 12 o'clock on the control dial is an exposure compensation control (+/- 3EV), at three o'clock a compendium of flash settings (auto, red eye reduction, fill in flash, flash off, red eye slow sync, slow sync, 'full' flash and incremental adjustments running from ½ to 1/64th strength), at six o'clock we get self timer/drive modes, and at nine o'clock the ability to manually specify the AF point, by selecting a point on a 35-zone grid that is overlaid on the real-time image. While chunky lugs for attaching said strap hang at either side of the camera, thankfully out of the way of fingers and controls, on the right hand flank, if viewing the camera from the back, as with the E-P3 we find a pair of covered ports for joint USB/AV output and mini HDMI output respectively. This cover, being a weaker plastic element amidst the surrounding brushed metal, is one of the very few flimsy points on the outwardly covetable camera. Again, we leveled the same criticism at the E-P3. Also plastic-y, but more reassuringly chunky, is the flip open cover protecting the joint battery and card compartment at the E-PL3's base. The PS-BLS1 rechargeable lithium ion battery supplied with the E-PL3, the same cell that comes with the E-P3 incidentally, is good for around 330 shots (the exact same performance as we got from the E-P3). There is the option here to use all varieties of SD media card too, up to and including SDXC cards. Dead centre, but slightly off-centre of the lens, is a screw thread for attaching a tripod.